If you can receive an advanced list of attending colleges, game planning will be easier. Highlight the schools of interest, then conduct some research. Arrive early and be prepared to 'attack' these schools. The lines will progressively get longer as the night wears on, so speaking to the representatives in the beginning will maximize your time. 'Practice' with a non-target school to learn what admissions representatives are discussing, promoting and asking. This will provide an idea of the 'lingo,' ultimately preparing you for your target colleges. As suggested, conduct some research. Hopefully you have written down notes and highlighted areas to further discuss, such as "tell me more about your Co-Op Engineering program" or "what kind of research opportunities are there for freshmen?" Do not ask basic questions that can be found in brochures or online. You may only have a minute to talk because of the crowd, so make it worthwhile. Ask specific questions about programs, opportunities or curriculum and put these answers next to your researched notes. Do not be shy, this is your opportunity to find out if you are a fit for this college. One last bit of advice. If you cannot attend your local college fair, do not fret. 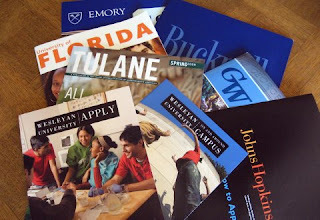 You will most likely be welcome at other school's college fair.